Stegosaurus Dinosaur Tail Spike and Spine Plate. Stegosaurus armatus. 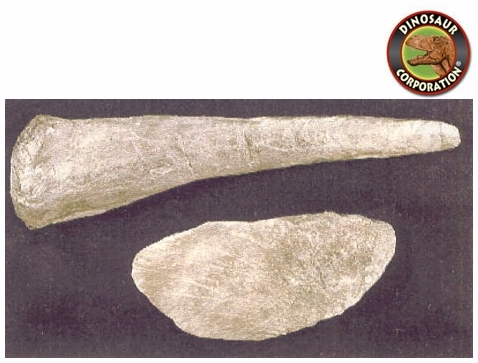 Fossil Replicas. Jurassic Morrison formation at the Cleveland-Lloyd Quarry, Utah. Stegosaurus is a genus of armored stegosaurid dinosaur. They lived during the Late Jurassic period (Kimmeridgian to early Tithonian), some 155 to 150 million years ago in what is now western North America. In 2006, a specimen of Stegosaurus was announced from Portugal, showing that they were present in Europe as well. Due to its distinctive tail spikes and plates, Stegosaurus is one of the most recognizable dinosaurs. At least three species have been identified in the upper Morrison Formation and are known from the remains of about 80 individuals.